OK - I'm going to resist the temptation to make some stupid joke about dialing 411 for more information about this car. If this looks more Italian to you than Japanese, there's a reason for that; this car was designed by Pinninfarina. The body has sort of a Lancia look to it and the interior, especially the dashboard design, would have looked right at home in any number of late sixties Italian sedans. With the 1600 engine from the Datsun roadster (known as the Fairlady - not a great sports car name - to much of the world), the RL411 was quick. In stock form, the car's handling was not spectacular (on par with most station wagons of the day) and the ride was on the rough side, but its top speed was well over 100MPH. In the 1960s, Italian design and Japanese build meant one thing... RUST. This car, although a Canadian import, spent most of its life in Arizona and is in remarkably rust free condition. The owner has done some substantial work to this car already. It appears that all that's left to do is restore the body. With very little or no rust repair to do, that won't be too tough of a job. I love the little mag wheels on this wagon. The rest of the car should be kept stock, though. It just looks so unique and cool as it is. I've seen a few "customized" sedans and they just don't look as good as a well restored original car. Body parts are getting tough to find for these cars, but this one is complete. Mechanical parts are easier to come by as they are shared with other Datsun models (but, being a 30+ year old car, most any part will have to be purchased from a specialty dealer) . The seller has some (unlisted) spare parts, which he is including with the car. This is just a cool little car. It's one you don't see very often and one that deserves to be restored to original condition. 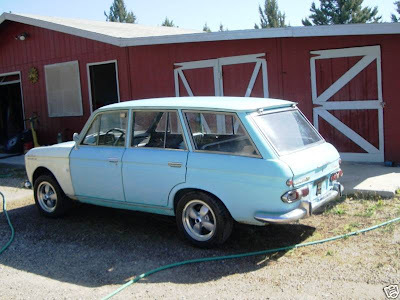 Click here to see the eBay listing for this Datsun 1967 RL411 wagon.